Piper Cherokees seen in Goldfinger. The Piper PA-28 is series of four-seater, single-engined piston powered aircraft. The PA-28 was first introduced in 1960 and continues to be produced in two variations. The PA-28 is generally known as the 'Cherokee', but other variations are also known under the names 'Warrior', 'Archer', 'Dakota' and 'Arrow'. 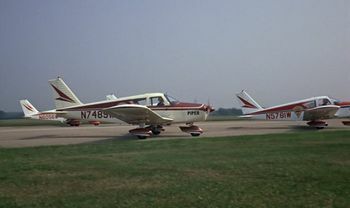 This page lists all films that feature a variation of the Piper PA-28. Pages in category "Piper PA-28"
This page was last modified on 9 August 2010, at 10:34.